Good news for the aspirants who had applied for the CCS HAU Group C Recruitment and waiting for the CCS HAU Clerk Admit Card 2019. We here provided the complete details about the Admit Card for which the competitors are waiting for. The higher officials of Chaudhary Charan Singh Haryana Agricultural University (CCS HAU) Hisar had scheduled the Exam Dates 2019 for 23rd February 2019 and 24th February 2019. The CCS HAU organization members had released the HAU Group C Hall Ticket 2019 on 18th February 2019. The examination center and timings will be clearly mentioned in that HAU Group C Hall Ticket 2019 itself. The Admit Card can be downloaded only from the official site @ hau.ac.in. Follow the steps given to the bottom of this page. From this section, you can get the details about what will appear on the HAU Group C Hall Ticket. Please cross check wheater the information present in it about you is correct or not. Before appearing for the CCS HAU Teacher Examination, you are advised to download the HAU Group C Hall Ticket. If you are appearing to the examination without your hau.ac.in Clerk Hall Ticket the higher officials of CCS HAU will not allow you to attend the written test. Along with the Hall Ticket, you have to carry any one of the government id proof which is provided below for verification purpose. In this section, we had provided the complete information which is helpful for downloading the hau.ac.in Clerk Hall Ticket easily. Candidates can go through the following steps for easy downloading. Firstly, applied candidates are requested to visit the official website of the Chaudhary Charan Singh Haryana Agricultural University (CCS HAU) Hisar. The official site for CCS HAU @ hau.ac.in. You will get the home page of the CCS HAU on the main screen. In that home page, scroll to the down and there you will get the Latest News section. Now in that section, starting itself you will get the link of HAU Group C Hall Ticket. Click on it and open that link. On the left side of the screen, you can see the Download Admit Card Button click on it. Then you will get a login page. Fill the details like Registration Number and Date Of Birth and then click on the submit button. There you will get the CCS HAU Clerk Admit Card in a new page. Download that HAU Group C Hall Ticket in the prescribed format. Take two to three copies of the Hall Ticket and carry them along with you while going to the examination. All the best for the aspirants who are going to attend the Written Test for the CCS HAU Group C Recruitment 2019. 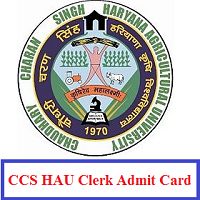 We hope that all the information provided in this article regarding the CCS HAU Clerk Admit Card 2019 is useful to the candidates who are ready to attend for the HAU Written Test. For more information keep visiting our webportal Freshers Now.